Two Uranians in the same house create a very high tension. Surprisingly, if this has not yet led to an explosion, but perhaps the explosion is yet to come! Aquarians have a deep affection for each other, they instantly recognize themselves similar in a detached view, speaking more about a special vision, and originality than about addiction to earthly affairs. The Aquarius parent does not have any plans at all about the child, and he can rest assured that the little Aquarius will be able to surprise him. 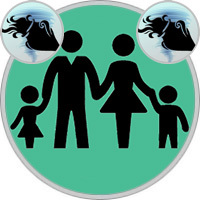 Because Aquarius likes to surround himself with people, family life for him will not be limited to communicating with relatives. Aquarius automatically associates friends with his relatives, he likes to communicate with different types of people. Because the baby Aquarius grows in a house where there are always a lot of guests, so he learns to easily get in touch with other people. In the family, Aquarius is allowed to be himself. These two believe that life is a great adventure, and very exciting! And they will try not to miss anything in it. True, sometimes it may seem like a job without common sense… But is it really important if they understand each other, can they exchange ideas and together think about what else can be done to save humanity? Both are rather unemotional and sometimes somewhat cold - except for their hobbies. They discuss this with great pleasure, loudly arguing and defending their opinion. They believe in justice and equality, honesty and freedom of thought. In a word, it is a union of two idealist thinkers. Little Aquarius can get from his mother too much freedom, which turns into arbitrariness. He loves everything in his own way and is also very stubborn, and a good-natured mother will allow him a lot. She believes that such an approach will help him develop independent thinking. When a child starts to argue, she thinks, he simply learns self-affirmation. But he needs to explain that there are limits to what is permissible, otherwise he can grow up to be a rebel, and everyone will suffer from this. Such a child needs a firm hand, but it is important not to crush in him all of his best qualities. Mom-Aquarius will help to find an application to his creative abilities and give a lot to his child, answering all his questions and explaining to him that good deeds can benefit society. But most importantly - this mom will allow Aquarius to be himself, which is really important for this extraordinary personality. Aquarius dad looks at his little experimenter and rebel and sees in him a worthy heir. Both are just overwhelmed with ideas, but, unfortunately, they lack some common sense. And although some of their plans are really excellent, they would be advised to consult with someone before embarking on the implementation of their projects. They are worried about everything new and do not scare the risk. Well, they have more energy, though half of it goes to talk. They value honesty and independence in each other, understand even some strangeness and unpredictability. Senior Aquarius is often an intellectual who is immersed in books, social issues and good deeds, and there is a risk that he simply will not notice the emotional needs of the child. And Aquarius, Jr. needs someone very much who he could turn to for help, although this does not happen very often. Most of the time he prefers to spend in the company of his father. This father accepts his offspring as they are, and does not require the child of what he does not show a tendency. Father will try to explain any of his demands, but sometimes he naively believes that this is enough. And Aquarius, the younger, must sometimes be brought to life by more effective methods! The father will always listen to the child and will try to help him with the lessons, discussing everything in the most serious way. Both of them do not like routine, are happy about everything new and want to look ahead, not counting the reflection on the future as a waste of time. Aquarius Sr. is sympathetic to the unusual choice of Aquarius’s younger friends. He generally refers to him as an adult, and next to such a father, he really feels like a person.